First, I cut out a bunch of different circles. You know me...no the circles were not perfectly round by any means. They were all just guesstimates. Then my daughter put a dab of glue in between each layer of fabric. Then she glued on random beads all over the trees...as you can see she is such an artist! Last night as we were laying in bed she told me that making those trees was a lot of fun and thanks mom. love your cute blog! i am your newest follower. 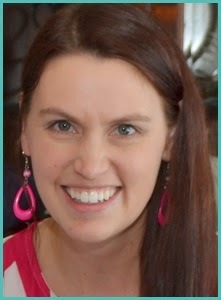 i added your linky button to the bottom of my blog! So adorable. The color makes me smile. And it warmed my heart that you are making time for your daughter--speaks highly of your mothering care. So fun! I totally want to make these now!